When was the last time you tried to do something where you felt completely out of your element? When was the last time you tried something where you felt completely clueless about how to proceed or what to do? I feel that way all the time because I like to create songs, but I don’t know the first thing about music. The last music class I ever took was in 4th grade. I remember I learned a tune on the flut-o-phone. My mother played the piano, and I remember asking her as a small boy if I could learn. I took one lesson from her and then didn’t want to do anymore. I regret that now. About 12 years ago, I heard my friend say that he practiced the guitar for 30 minutes a day for 6 months and after that time he could play songs. I decided I wanted to play enough to strum chords and make songs, so I did it. So I know a set amount of guitar chords, but that is it when it comes to music. I can’t read a note. Honestly, I know nothing about music, but I’ve written several musicals – of course, not without help. Here’s what I’m working with now, my ipad Garageband. I turn on my digital recorder and then just create some sort of catchy melody in head which I will hum or sing with mock lyrics into the recorder. Once I have that basic tune, I’ll sit at my computer with my headphones on, listening back to the tune, and I’ll start pounding out some lyrics. As I polish the lyrics, that usually helps to refine the melody, of which, I’ll re-record with my vocals. 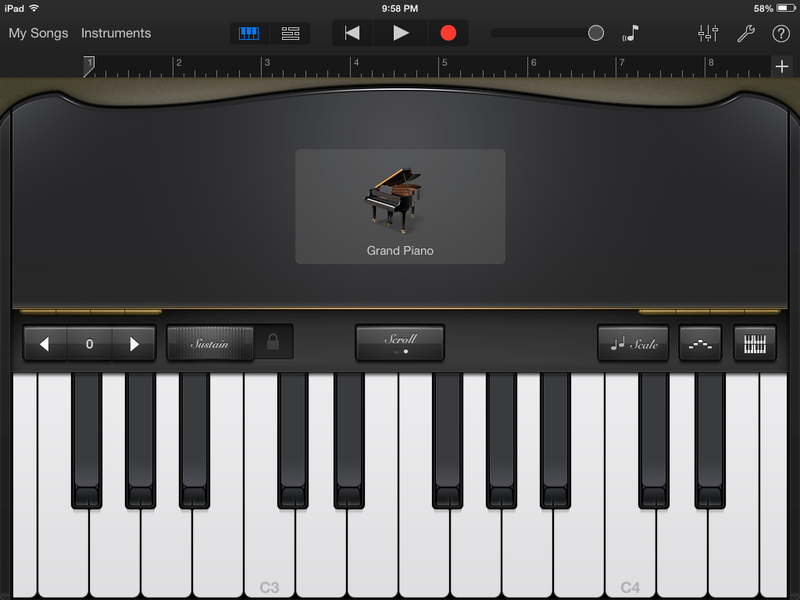 This week, however, I discovered that I can get out my ipad and peck out the melody on the grand piano. So now, I’ll record the melody on my ipad, combine the melody with my vocals on Audacity, create an mp3 file, and then call in the cavalry. I’ll send my crude recordings to my co-composer who does all the heavy lifting, since she actually knows what she is doing. She’ll arrange, record, and score the song until it’s amazing. So I just finished part I of my new mini-musical. Sounding great, so far. I love musical writing. It’s a very fun, rewarding creative outlet that is different from storytelling. So if I can write music, trust me, you can do anything you always wanted to do but were afraid to try. Go for it! This entry was posted in 10-minute play, Indie Author, Writing Process and tagged do hard things, garageband, lyric wriing, musical writing, process of writing, writing music by sassevn. Bookmark the permalink.